The Landmarks Preservation Commission held a hearing January 13, 2009 on the second revision of plans by Aby Rosen to enlarge the low-rise building that occupies the west blockfront on Madison Avenue between 76th and 77th Streets. The new plan is quite similar to the first revision that was submitted last year except that the façade color of the addition will now be silvery rather than champagne. 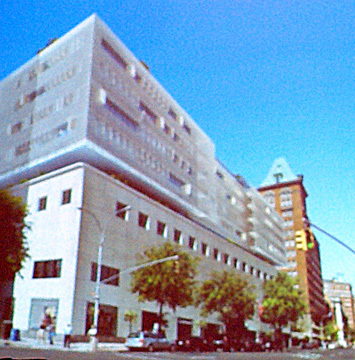 Both "as-of-right" proposals were significantly downscaled from Mr. Rosen's initial proposal, designed by Sir Norman Foster, that called for a reflective-glass, curved tower to rise 22-stories above the northern end of the existing building with the remainder of the existing building's large roof being converted to a sculpture garden. All of the proposals would restore the existing 5-story, limestone-clad building designed in 1950 by Walker & Poor to house the Parke-Bernet auction house, that was later bought by Sotheby's, and a Schraff's restaurant. The building had been modified several times. The commission did not vote on the first design offered by Mr. Rosen and his architect, Sir Norman Foster, who has also designed the revised plans. The first and second revisions would contain about 18 condominium apartments. Whereas the first design (see The City Review article) did not comply with existing zoning and building regulations, the first and second revisions do and only require approval from the landmarks commission because it falls within an historic district. The façade of the addition in the revised designs is very unusual and consists of a "veil" of thin horizontal strips several feet in front of glazing. Many of the strips can open as shutters at a 90-degree angle and then several of them can be moved, like an accordion, to one side to create a quite broad opening. 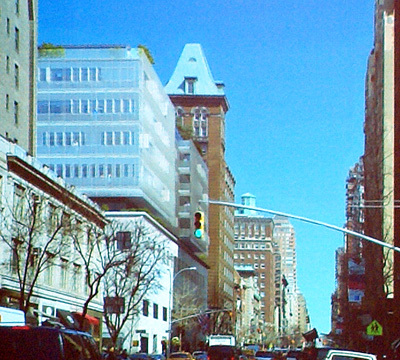 Brandon Haw of the Foster + Partners office said at a previous hearing (see The City Review article) that this part of the façade of the addition will add "a mysterious feeling" and would be a "contemporary" addition to the "elegance" of the Upper East Side. Lord Foster is also designing a mixed-use tower for Mr. Rosen at 610 Lexington Avenue. Commissioner Steven Byrns said that the restoration of the former Parke-Bernet Building is "very important" and said that the current plan "overwhelms" it. He suggested that the "addition" should be recessed and have only two full floors and then one more setback from them and possibly one more setback even further. Commissioner Margery Perlmutter said that the new plan "is a good piece of architecture" and was "elegant." Pablo E. Vengoechea, the commission's vice chair, said he would like to see a better "transition" between the old and new sections of the project," adding that while he had no problem with the previous color the new plan was "very top heavy." Furthermore, he suggested that the developer should "eliminate the artificial recess" in the center of the avenue frontage of the addition so that the addition would become more "abstract." Mr. Haw, however, had explained that the "recess" was mandated by the site's zoning. Commissioner Joan Gerner said that the plan's materials were "exquisite" and that "the only problem is that it is too high" and that she could "support three stories with a setback." Commissioner Diane Chapin said that the addition should have its own character to serve as a counterpoint. Commissioner Roberta Brandes Gratz did not attend the meeting but submitted a statement in which she expressed concerns about precedents relating to the scale of additions. Robert B. Tierney, the commission chair, described the revised plan as "brilliant," but urged the applicant to consider the commissioner's concern about reduction in scale and no vote was taken. Mr. Rosen, who is an owner of Lever House and the Seagram Building, two of the city's most famous world-class modern landmarks, told thecityreview.com after the hearing in January that he will "consider" returning to the commission with a design that takes into account many of the commissioners' comments. Most of the commissioners have argued that the scale of the proposed addition is too big because the nature of the avenue within the special district is one that alternates low and high very consistently. While that is almost accurate, it is an exaggeration and one that has little to do with quality but sheer bulk that may be stylistically competely out of "context." It is true that Madison Avenue has a quirky character on the Upper East Side but one that comes primarily from its ever-changing retail spaces more than its architecture that is not particularly distinguished nor consistent. Common sense tells you that restoring the building to its original architecture is not particularly an improvement. It may be historically correct, but aesthetically not very pleasing. The commission usually does not take notice of such niceties and is a stickler strict conformity with history, a position that is not necessarily always untenable. The first Foster scheme remains the best of those offered so far. It offered not only a very thorough and good restoration of the original building, which is a substantial project, but also a rooftop sculpture garden and a svelte new curved glass tower setback at the north end of the building near 77th Street across from the Mark Hotel. That tower would, of course, have blocked some southern views from The Mark and some eastern views from the Hotel Carlyle across the avenue, but certainly not all and moreover because of the curved and reflective quality of the tower would have offered rather interesting vistas. Perhaps more importantly, it would also have given the avenue a decent new "modern" building that was cleancut and brutal and not overwhelming. The two revisions are rather surprising because they deprive the developer of the opportunity to offer potential buyers apartments with great vistas because of their significantly lower heights and because they are almost too demure and discrete. The silver color does make more sense than bronze and the accordion shutters are very intriguing, but one wonders how the developer to eek out a profit if he has to reduce the bulk of the addition even further especially since he is only utilizing a fraction of the available development rights. The suggestion by some commissioners that Foster take off one or two floors of the four-story addition and then set it back substantially is certainly throwing down a very nasty gauntlet, one that smacks of NIMBY and circle-the-wagon Neanderthalism in the face of the most exciting architectural age in history. The Foster designs here are not masterpieces but they are also not monsters. The first and second revisions are interesting but the first plan remains the best because it will help the Upper East Side regain its architectural footing without sacrificing classiness. Apart from Fifth and Park Avenues, the Upper East Side's avenue architecture is generally abysmal and desperately in need of a dynamic infusion of energy and drama. As one who has many fond memories of listening to John Marion at his rostrum in the Parke-Bernet galleries, I would be one of the first to fend off the philistines storming his palace if it were a palace, but the building never was and just because it is in an historic district does not make it a legitimate architectural landmark.